We are first responders in temporary staffing. quick service and prepared employees. Successfully completed your password reset request! By accessing this Site, you reaffirm, on behalf of CLIENT, the terms and conditions of the Temporary Services Agreement between ALLIED FORCES and CLIENT. By accessing this Site, you also confirm that CLIENT is bound by the Portal Use Agreement that governs access to the Site. All capitalized terms on this Mobile Site have the meaning set out in the Portal Use Agreement. 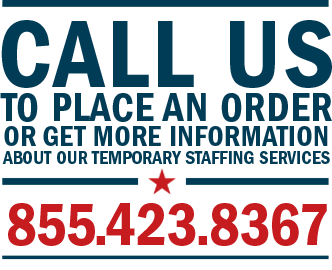 The information you enter through this Mobile Site concerning ALLIED FORCES’ employees’ work constitutes records of the employees’ time worked. ALLIED FORCES will preserve this information electronically as the official record of the employees’ time worked. CONTACT ALLIED FORCES IMMEDIATELY IF YOU HAVE ANY REASON TO BELIEVE THAT INACCURATE INFORMATION HAS BEEN TRANSMITTED TO ALLIED FORCES OR ANY REASON TO BELIEVE ANYONE HAS ACCESSED THE SITE WITHOUT CLIENT’S AUTHORIZATION. DO NOT SUBMIT PERSONAL INFORMATION CONCERNING YOURSELF OR ANY EMPLOYEE OTHER THAN NAMES. The Internet is inherently an unsecure environment. ALLIED FORCES uses commercially reasonable hardware and software techniques (i.e., firewalls, encryption, authentication, stand-alone network) to secure the confidentiality of CLIENT and USER information provided to ALLIED FORCES or posted to the Site. SAFETY FIRST. Safety is everyone’s responsibility. The law requires entities that control the worksite to provide a safe work environment. Employees are required to observe all safety procedures on the job. Prior agreement is required to use ALLIED FORCES employees on equipment.